Does Ivy Bridge really run this cool? I see you are using the ASUS utility for monitoring temperatures. I have the same ASUS utility, unfortunately it doesn't actually report the CPU temps. It claims that it is, but it really isn't. Not sure what temperature sensor it is actually reading, near as I could determine it is the socket temperature and not the CPU temperature. To check your CPU temperatures you need to download RealTemp or CoreTemp. Then be prepared to be surprised at how hot your IB is actually running. Ah, thanks. I knew it was too good to be true! I choked for a second when I saw the first temps, lol. CPUID's HW Monitor gives various temperatures of the chip, from core, to package. Its very different from chip to chip. 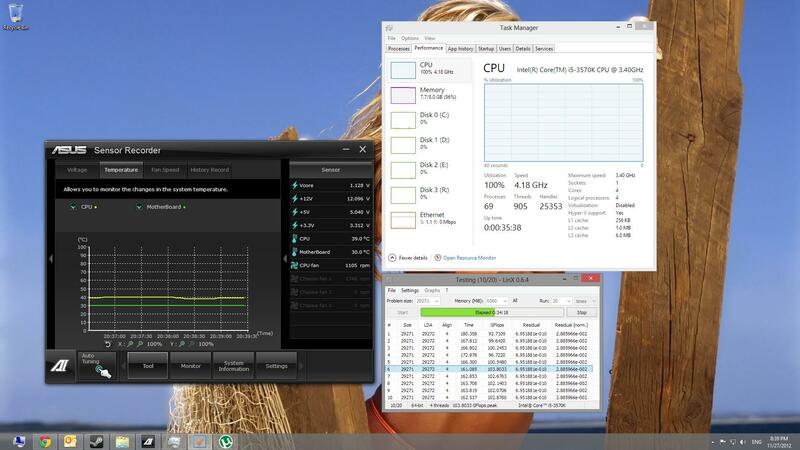 One friend got it at around 65C at 4.5Ghz. your cpu is hot because of the desktop background. move those damn windows! I got 3570k combo from Microcenter and I just put it to stress test yesterday. I had it under lapped Scythe Ninja 3 cooler. There were only two fans in an entire system, 1000RPM nexus exhaust fan, and PSU fan at the top of the case that was spinning at maybe 500rpm? There was no fan on the CPU heatsink itself. 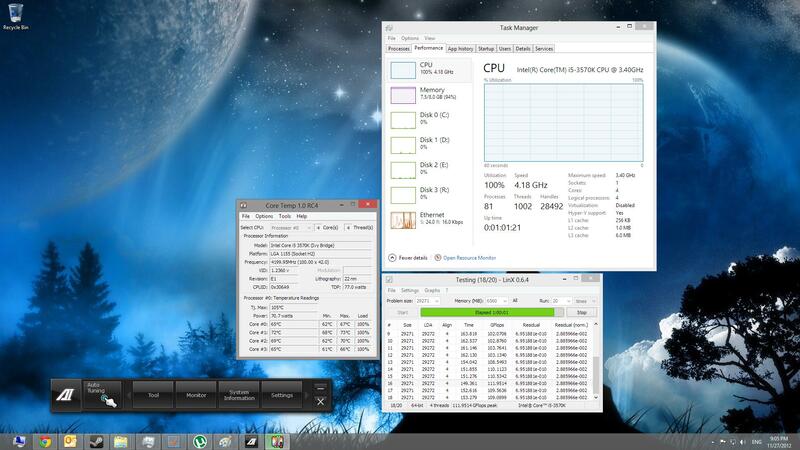 Under Prime95 my highest core temperature was 61 degrees. So in my experience they do run cool as long as you're not planning to overclock/overvolt them. As well as they should at stock. The high temps on an Ivy are due to the TIM on the silicon die itself being not as good at dissipating heat to the IHS and beyond, not because it a large amount of watts flow through it. Hmmm... My i5-3570k is not overclocked, is using the integrated video, and has a Scythe Mugen 3 cooler with the fan speed at about 750 RPM. Why is your multiplier @ 16 under load? My guess is the load simply wasn't high enough to make the processor ramp up. Some of the games I have installed on my PC run without loading my 3570K enough to make it go above 1600mhz either.